The Redwood Coast Energy Authority’s (RCEA) Board of Directors approved two proposals at their March 28 meeting to advance the goals of Humboldt County’s Community Choice Energy program. The first was a resolution targeting a 100% clean and renewable electricity mix for RCEA’s community choice energy program by 2025. The City of Eureka, the City of Arcata, and the County of Humboldt have adopted similar resolutions. The 100 percent clean and renewable resolution was recommended by RCEA’s Community Advisory Committee to accelerate RCEA’s previously established renewable energy goals. The new Feed-In Tariff Program will facilitate the construction of new projects to help meet the 2025 target with local solar and other renewable energy generation projects located within the county. For more information, please visit the Power Sources page on our website. RCEA has discovered an error on some customer’s bills. It does NOT affect energy or billing amounts shown; it’s purely descriptive. PG&E accidentally used the Time-of-Use definition on an unspecified number of bills, regardless of the rate schedule customers are on. Those accounts did not experience a change to their rate schedule or the way their energy use was calculated. The bill time-frame that has been affected is 10/5 to 10/23. We took immediate action to fix the error, and the issue should be resolved within the next week or so. Who is the Redwood Coast Energy Authority? What do we do? How do we serve our community? This first issue (a downloadable PDF) provides a good overview of RCEA’s past, present and future programs, activities, and milestones – just in time for Energy Action Month. Please call or stop by if you’d like to discuss any of this. Better yet – come see us on Saturday, October 6 at the Sequoia Park Zoo as we sponsor a FREE DAY for the entire community (see back cover). EUREKA, California, September 12, 2018 – The Redwood Coast Energy Authority (RCEA), with support from a consortium of private companies, has submitted a lease application to the Bureau of Ocean Energy Management (BOEM) to advance the development of an offshore wind energy project off the coast of Humboldt County, in Northern California. The 100-150 megawatt (MW) floating offshore wind farm is planned to be located more than 20 miles off the coast of Eureka. RCEA and the consortium, which includes Principle Power Inc., EDPR Offshore North America LLC, and Aker Solutions Inc., have been working with members of the community since 2017 to explore and develop the offshore wind potential of Humboldt County. RCEA initiated a competitive process earlier this year and selected the consortium to enter into a public-private partnership to pursue the development of the proposed project. Since its founding in 2003, RCEA, a local government joint powers agency, has provided an array of energy services to Humboldt County residents and businesses. In recent months, RCEA has done an increasing amount of community outreach – informing the public and commercial interests, gathering feedback, and listening to and incorporating the concerns and desires of the region – to form the basis for the lease application submitted to BOEM. The project is expected to bring significant economic benefits to the region in the form of jobs and increased spending in the local community and State of California. A longer-term goal of the project is for Humboldt Bay to become a central hub of a US west coast offshore wind industry. RCEA’s work with the Humboldt community, state and federal agencies, and others has generated an overall positive response to the proposed project and sets the framework for successfully delivering clean energy to local ratepayers at a competitive cost, under an efficient, locally driven and guided development philosophy. RCEA and the consortium will continue to focus on community and stakeholder outreach during this multi-year process to understand and address potential concerns. RCEA and its project partners engaged in a systematic, comprehensive process to determine a location for the Humboldt offshore site that minimizes impacts to the environment and communities, including commercial fishing, that are active offshore. Based on this interactive process, the proposed lease area will support selecting a final project site for an expected 10-15 turbines that avoids or minimizes impacts on marine navigation corridors, major commercial fishing areas, and environmental resources. RCEA‘s project partners bring the expertise needed to develop, finance, and operate projects as well as build an offshore wind energy supply chain. The complementary capabilities of Principle Power, EDPR, and Aker Solutions bring the long-term commitment needed for a successful project. RCEA and its consortium of development partners are working to bring the project online in 2024, which will help unlock the extraordinary value of offshore wind energy for California. The Redwood Coast Energy Authority is a local government Joint Powers Agency whose members include the County of Humboldt; the Cities of Arcata, Blue Lake, Eureka, Ferndale, Fortuna, Rio Dell, and Trinidad; and the Humboldt Bay Municipal Water District. The purpose of the Energy Authority is to develop and implement sustainable energy initiatives that reduce energy demand, increase energy efficiency, and advance the use of clean, efficient and renewable resources available in the region for the benefit of the Member agencies and their constituents. Curious how the Redwood Coast Energy Authority’s (RCEA) generation charges compare to PG&E’s? RCEA recently partnered with PG&E to provide customers with a comparison of average monthly charges and energy sources. RCEA and PG&E are required to provide this side-by-side rate and power content comparison in an annual postcard mailer to all electric customers in the county. Most customers should have received their card by now, but it can also be seen on PG&E’s website, pge.com/cca. Copies are also available at RCEA’s office at 633 3rd Street in Old Town Eureka and can be re-mailed upon request. Specific rates not included in the cards can also be found online. RCEA’s default electricity option, called REpower, costs 3% less than PG&E’s equivalent generation rate. By comparison, PG&E’s electricity supply mix is about 33% from renewable sources while RCEA’s Repower is 44%. REpower+, with 100% renewable electricity, costs just a penny more per kilowatt-hour than REpower. Additionally, eligible RCEA customers continue to receive full CARE, FERA and Medical Baseline discounts. RCEA’s Community Choice Energy Program was launched in May of 2017 and is now serving about 62,000 customers in Humboldt County. The Redwood Coast Energy Authority (“RCEA”) has selected a consortium of companies comprised of Principle Power Inc., EDPR Offshore North America LLC, Aker Solutions Inc., H. T. Harvey & Associates, and Herrera Environmental Consultants Inc. to enter into a public-private partnership to pursue the development of an offshore wind energy project off the Northern California coast. The consortium was one of the six respondents to the Request for Qualifications (RFQ) issued by the RCEA on February 1st, 2018. “We have been very impressed and humbled by the respondents and the quality of the responses we received for this RFQ. Large development companies and energy players based in Europe and the US responded to the RFQ which helps confirm the attractiveness of Humboldt County as the potential starting point for an entire new industry,” said Matthew Marshall, Executive Director of the RCEA. The consortium is excited with the opportunity presented by RCEA and pleased to bring proven technology, development expertise, and financial capabilities to the partnership, which will work toward a flagship project for the floating offshore wind industry in California and the US in general. “We believe this project can represent a game changer for the industry in the US. The establishment of a public private partnership with a community-based energy provider like RCEA represents a unique opportunity to develop a project with strong foundations from the get-go, and to build a comprehensive launching pad for a successful industry in the West Coast” said Joao Metelo, Principle Power’s President and CEO. “We are excited to be part of this first commercial scale project for floating offshore wind in the United States. Combining our capabilities with Principle Power’s technology can help mature the local supply chain, potentially generating industry growth in Humboldt County and the state of California,” said Jonah Margulis, Vice President and U.S. Country Manager at Aker Solutions. Humboldt County has natural enabling advantages that make it a prospective stepping stone for the offshore wind energy industry on the West Coast of the US. The wind resource off the Humboldt County coast is the best off California with average wind speeds of more than ten meters per second, inducing expected high capacity performance from wind farms. The proposed project is a 100-150 megawatts floating offshore wind farm planned to be located more than 20 miles off the coast of Eureka. The project will pave the way for offshore wind energy off the West Coast and may be the first project to unlock the extraordinary value of offshore wind energy for California. The selected consortium features significant offshore wind lease application and permitting experience, a mature, cost-competitive and suitable floating wind technology for Humboldt County’s unique geography (Principle Power Inc’s WindFloat technology), and a highly-capable team with the needed capacity to develop, finance, operate and build a supply chain to support this and future projects. RCEA and the selected consortium will be negotiating and finalizing a partnership agreement in the coming weeks, working toward the goal of submitting a lease application later this spring. Humboldt County is marked by a strong ecosystem of local energy, environmental, and economic professionals who played a crucial role in the 15-member RFQ review committee along with local officials and public agencies. Input and guidance from local stakeholders will be critically important to the project and the overall development of the industry in California. With RCEA leading, the project partners will continue proactive community and stakeholder outreach to understand and address all the facets of developing a project of this kind to minimize any potential impacts and maximize local community benefits. The project is expected to drive investment in local infrastructure at the Port of Humboldt Bay and other nearby onshore facilities. A strong collaboration with local stakeholders to identify and address needed infrastructure improvements will be led by the project partners. The upcoming offshore wind industry will also require skilled labor and create local jobs and workforce training, thus advantageously positioning Humboldt County as a leading hub for future offshore wind development throughout the West Coast. Principle Power (www.principlepowerinc.com), founded in 2007, is a development, technology and services provider to the offshore wind industry. Principle Power’s innovative and proven technology, the WindFloat – a floating wind turbine foundation – provides access to transitional and deep-water offshore wind sites. 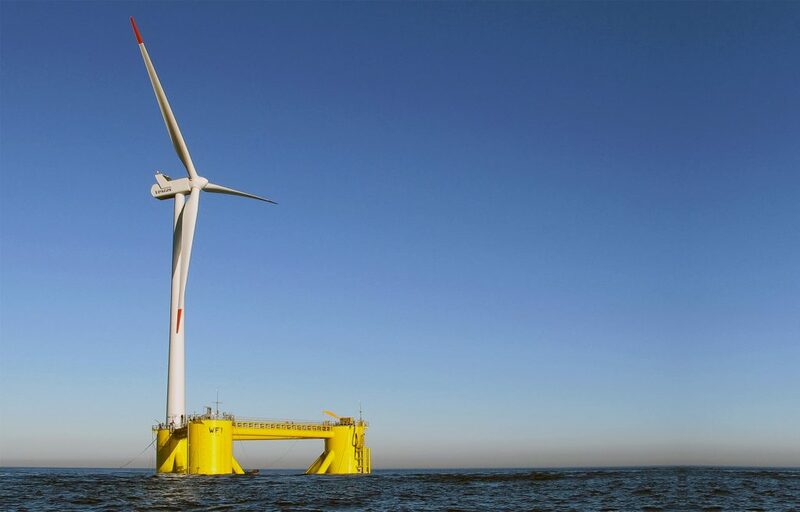 By simplifying the way offshore wind is deployed, this unique technology assists the ongoing development of the offshore wind industry as whole, opens new deep water markets, and has the potential to substantially decrease the cost and risk profile of offshore wind projects. Principle Power, with offices in the USA, France and Portugal, sells the WindFloat as a technology solution and acts as a service provider to developers, independent power producers, and utilities engaged in the rapidly expanding global offshore wind market. EDP Renewables (Euronext: EDPR) is a global leader in the renewable energy sector and the world’s fourth-largest wind energy producer. With a sound development pipeline, first class assets and market-leading operating capacity, EDPR has undergone exceptional development in recent years and is currently present in 12 markets (Belgium, Brazil, Canada, France, Italy, Mexico, Poland, Portugal, Romania, Spain, the UK and the US). Energias de Portugal, S.A. (“EDP”), the principal shareholder of EDPR, is a global energy company and a leader in value creation, innovation and sustainability. EDP has featured on the Dow Jones Sustainability Index for ten consecutive years. For further information, please visit www.edpr.com. Since 1970, the highly-trained ecologists and professionals at H. T. Harvey & Associates have delivered exceptional consulting services to public agencies, private entities, and nonprofit organizations. H. T. Harvey & Associates applies expertise in avian and other wildlife ecology, fish and aquatic ecology, plant ecology, restoration ecology, and landscape architecture in pursuit of its mission to create ecologically sound solutions to clients’ complex natural resource challenges. Areas of service include environmental analysis, permitting, compliance support, restoration design, conservation planning, landscape architecture and planning, and ecological research. For more information visit www.harveyecology.com. About Herrera Environmental Consultants, Inc.
Can offshore wind energy reshape the future of Humboldt County? The North Coast Journal published a feature story on the potential of offshore wind and RCEA’s plans. Read the full article HERE, and also below. As legalized recreational cannabis takes hold in California, some Humboldt County officials think the local economy’s future isn’t tied to farms in the hills. It might be in the wind. A triad of factors has state and local officials, as well as energy companies, increasingly excited about the potential of offshore wind energy in Humboldt County, with the hope it could become a hub for the emerging renewable energy technology, transforming the local electric grid into 100 percent renewable energy while creating hundreds of jobs and revitalizing the port. Redwood Coast Energy Authority Executive Director Matthew Marshall says that while wind energy is nothing new, its local potential is. What’s historically ruled the North Coast out of wind energy discussions, Marshall says, is that the waters off the local coast “get too deep, too quick,” meaning the wind turbines used in shallow waters off the East Coast and elsewhere won’t work off the Humboldt County coastline. But a new floating platform technology is proving to be a game changer. The technology, which involved massive, 750-plus-foot-tall wind turbines fixed to partially submerged barges or platforms that are then tethered to the ocean floor, is proving viable, with the first full-scale deep water wind farm opening off the coast of Scotland last fall, after nearly a decade of pilot tests. State officials in California, which passed Senate Bill 350 in 2015 pledging the state to transition to 50 percent renewable energy by 2030, have taken notice and begun looking at offshore wind as a viable option for reshaping the state’s electric grid. “Three years ago, offshore wind energy wasn’t in our thought process,” said California Energy Commission Renewable Energy Integration Specialist Michael Sokol at a recent meeting convened by RCEA. He made clear that it is now. Part of what’s tantalizing about offshore wind for state officials is its potential balance with the state’s existing solar infrastructure. While solar energy production peaks at midday and vanishes at sunset, offshore wind would see its highest production in the late afternoon and evening, lessening the need for energy storage. With California officials feeling an urgency to find renewable technologies that could work on a large scale and the emerging floating platform technology making the Pacific Coast potentially viable for offshore wind, eyes turned to the Central Coast. While the wind potential down south isn’t as strong as off the North Coast, its proximity to population centers and energy infrastructure made the location a natural fit. State and federal officials were busy last summer conducting hearings and outreach on a lease application for a wind farm near San Luis Obispo until the U.S. Navy quietly threw a wrench in those plans back in August, signaling that it would veto the application because it could interfere with military testing operations. But the Navy didn’t stop there, deeming the entire coastline from Los Angeles to north of Big Sur — more than 35,000 square miles — off limits. That left Humboldt County as one of the only viable candidates for potential sites. In addition to getting the crucial OK from the Navy, Humboldt Bay is the only port in the northern stretch of the state that would be able to bring the huge turbines into port for maintenance, as they are too tall to clear the bridges of the San Francisco Bay. Seemingly all of a sudden, the California Energy Commission began pointing energy companies toward Humboldt Bay. At that point, Marshall says, RCEA had already entered into a partnership with Principal Power Inc., a technology and services provider for the offshore deep water wind energy market based in the Bay Area, to assess the potential of offshore wind energy. As the community choice aggregator for Humboldt County, RCEA has a clear stake in the outcome of the process and Marshall says the agency also wanted to ensure a local entity is involved in the process and conversations in order to retain some local control and ensure Humboldt doesn’t end up at the whim of a large, multi-national energy company. But when news of the Navy’s veto of the majority of California’s coast became public, Marshall says things kicked into high gear. RCEA is now circulating a request for qualifications, looking for other entities with the “needed technical and financial” means to help cooperatively develop Humboldt County’s offshore wind infrastructure. The agency hopes to find partners by the end of March. Marshall says, the plan is to start small with a farm consisting of 10 to 15 wind turbines located 20 to 30 miles offshore, with the potential to scale up. For the moment, there isn’t much incentive to go larger than that, Marshall says, as the infrastructure to connect Humboldt County to the rest of the state’s electric grid doesn’t exist, meaning it can’t export excess electricity. Changing that would require either extending high-capacity power lines east through Trinity County to connect with the state grid in Cottonwood or building an undersea transport system to the south. Both would come with price tags in the hundreds of millions of dollars. While the conversation is entirely speculative at this point, it has local officials abuzz at the potential. As the executive director of the Environmental Protection Information Center, Tom Wheeler jokes that he’s often in the position of playing bad cop and shooting holes in development ideas. But not in this case. The wildlife impacts question seems a hard one to answer, as there’s been minimal study on the issue so far. At 20 to 30 miles offshore, Wheeler says there aren’t the concerns about harm to bald eagles, golden eagles and bats that onshore wind farms bring. But there are some concerns about impacts to pelagic birds and marine life. Most notably, Wheeler says there is the question of whether the vibrations or sounds from the windmills would affect migrating whales along the coast, which is currently unknown. Wheeler also says he’s heard concerns that the floating platforms could attract sea birds by becoming “reef-like” ecosystems that draw fish and, consequently, feeding birds that would then get caught in the propellers. Humboldt Bay Harbor District CEO Larry Oetker says the topic of an offshore wind farm has been on his radar since he stepped into the job in December. If things move forward, Oetker says, it would necessitate infrastructure improvements in the bay. Currently, he says, the bay entrance is deep enough and wide enough to accommodate barges pulling the wind turbines into port for maintenance and repairs. The problem is the docks in the bay — all of which were built primarily for loading and unloading wood products — can’t handle the weight of the turbines, which run some 500 tons. But rebuilding one of the bay’s docks to accommodate that kind of tonnage, along with the hoists needed to move things of that size, could create a host of other shipping possibilities. “That would open up a whole container world to us, having containers come in and out of the port,” Oetker says. While at least initially the turbines themselves would be shipped to the North Coast, Marshall says, there would need to be local maintenance and repair crews, which would create some jobs. But if the farm proves successful and scales up, there’s the potential for the large-scale creation of well-paying jobs locally. The port of Grimsby in England used to be home to one of the world’s largest fishing fleets back in the 1950s, but declines in fisheries and territorial squabbles over the waters of neighboring countries have largely decimated it, sending the city into a deep economic slump and one of the nation’s highest unemployment rates. But about a decade ago, energy companies came calling about offshore wind. According to the PRI report, the offshore wind boom has resulted in the creation of thousands of jobs, with more on the way as England looks to ramp up its use of renewable energy in the coming decades. In addition to the technicians and maintenance workers needed to keep the wind farms up and running, Grimsby has welcomed a number of factories that manufacture the massive turbines, which have hand-made blades that weigh 30 tons and stretch 250 feet long. If the pilot project gets up and running and does well, Marshall says, there’s similar potential in Humboldt County. He says he can envision wind power companies buying up land on the Samoa Peninsula — which is designated as a free trade zone and comes with some special tax benefits to companies located there — and producing turbines locally. Further, he says, there’s the potential for numerous licensed farms along the Northern California and Oregon coasts, with Humboldt Bay serving as the production and maintenance hub. “If the sector really takes off, then there’s that potential next phase,” he says. But that’s all putting the cart way before the horse. Marshall says RCEA is currently meeting with stakeholders and gather public input, having already met with representatives of the fishing industry, local governments, environmental groups and local tribes. So far the feedback has been invaluable and largely supportive, Marshall says. As an example, he says fishermen balked at the initial proposal to locate the farm 15 to 20 miles off shore, saying 15 “would be horrible,” but were fine with it being 20 to 30 miles out, so RCEA adjusted plans accordingly. The added distance, Marshall says, will also mean the turbines will be even less visible from shore. Spotting them, he says, will be somewhat like trying to find the smoke stack on the old pulp mill while standing on Trinidad Head. “Getting 20 to 30 miles off the coast, you’re going to be lucky to be able to see it on a clear day with binoculars,” he says. Having already gathered a lot of stakeholder input, RCEA will now begin to reaching out to the general public. To that end, Marshall says the agency has a pair of informal public information sessions planned — from 4 to 7 p.m. on March 5 at the Social Club in Samoa and March 6 at Plaza Grill — when folks can drop in, have a snack and a beverage and learn more about the project. Meanwhile, RCEA hopes to identify partners with an eye on hitting the ground running on a proposal this spring. But Marshall warns the process will be slow. Once RCEA has partnerships in place and its ducks in a row, it will begin the lease process with the Bureau of Ocean Management by submitting an application. If the bureau deems there’s competitive interest — which seems likely in this case — it would put the lease out to auction. Once a high bidder secures the rights, the project would then undergo studies, evaluations, site plans and environmental review. The Redwood Coast Energy Authority is issuing this Request for Qualifications (RFQ) to select a qualified entity or group of entities to enter into a public-private partnership for pursuing the development of an offshore wind energy project off the Northern California coast. Questions about this RFQ can be submitted in writing prior to February 9, 2018, 5:00 p.m. Pacific Time. It is anticipated that any questions and answers will be distributed by February 14, 2018. Statements of Qualifications are due February 28, 2018 at 5:00 p.m. Pacific Time. Responses should be submitted electronically via email in PDF file format. The distribution list for this RFQ announcement is here. Please feel free to share with anyone else who may be interested.